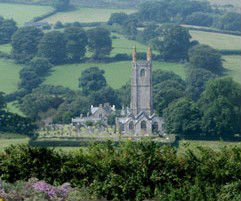 Widecombe Church has received the nickname "Cathedral of the Moor" because of its 120-foot tower and relatively large capacity for such a small village. The church was originally built in the fourteenth century, in the Perpendicular (late Gothic) style, using locally quarried granite. It was enlarged over the following two centuries, partly on the proceeds of the local tin-mining trade. Inside, the ceiling is decorated with a large number of decorative roof bosses, including the tinner's emblem of a circle of three hares (known in the past as the Tinners' Rabbits).